The Papua New Guinea Defence Force could start to take control of the Manus Island detention centre with about 600 men refusing to leave the site following its official closure. The refugees and asylum seekers are choosing to stay at the centre despite cuts to water, food and some power supplies. They say they do not feel safe at the alternative accommodation that is being provided. Rohingya refugee Imran Mohammad told RN Breakfast he did not believe PNG authorities could protect them. “We are not here for food, we are not here for electricity, we're not here for water, we're here because we're persecuted in our country we left violence. We want a safe country and we want our freedom,” he said. 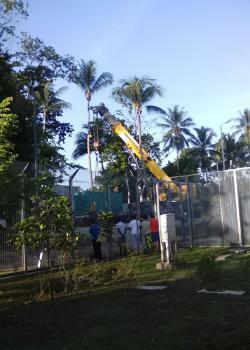 In a final notice posted by Immigration authorities on Sunday night, the men were told the PNG Defence Force would start to take control of the site from today. It warns the men anyone choosing to remain will be liable for removal from an active military base. The ABC was allowed access to the detention centre Tuesday and one man described how contractors had cut pipes and emptied water tanks. “We have cleaned the compound by ourselves,” the man said. Gesturing to a row of wheelie bins filled with water, he said residents were confident they could survive for at least a month. A Federal Government spokeswoman said the alternative accommodations of East Lorengau Refugee Transit Centre and West Lorengau Haus, and Hillside Haus were "safe and secure". “[East Lorengau Refugee Transit Centre and West Lorengau Haus] is close to the town of Lorengau, is safe and secure, provides accommodation while [refugees] consider their future,” she said. “PNG will provide an allowance, but they will have to shop/cook/cater for themselves. There will be healthcare facilities and staff. “[Hillside Haus] is a safe and secure facility to temporarily house non-refugees … it is an open facility, they can come and go as they please. Acting Prime Minister Julie Bishop urged the men to leave the detention centre and to move to one of the other three other accommodation centres. She said it was not up to Australia to guarantee their safety. “Papua New Guinea is a sovereign government of a population of over 8 million people responsible for law and order and for security,” Bishop said. That is at odds with a statement from PNG Immigration Minister Petrus Thomas earlier this week in which he said PNG also had no obligation to deal with asylum seekers found not to be refugees. “PNG has no obligation under the current arrangement to deal with these two cohorts and they remain the responsibility of Australia to pursue third-country options and liaise with respective governments of the non-refugees for their voluntary or involuntary return,” Thomas said. “There has to be a clear understanding of what Australia will continue and support PNG in the next few months to deal with the remaining caseload,” he said. But Greens senator Nick McKim said one of those facilities is not finished yet and he argued the other two do not have the standard of services that should be provided. He has renewed his attacks on Immigration Minister Peter Dutton, calling him a “monster” a “racist” and a “fascist”. Dutton hit out at the asylum seekers and at Senator McKim in a statement.